Check out these locally hosted Mother's Day Brunch Events. I have never been disappointed with their food here. 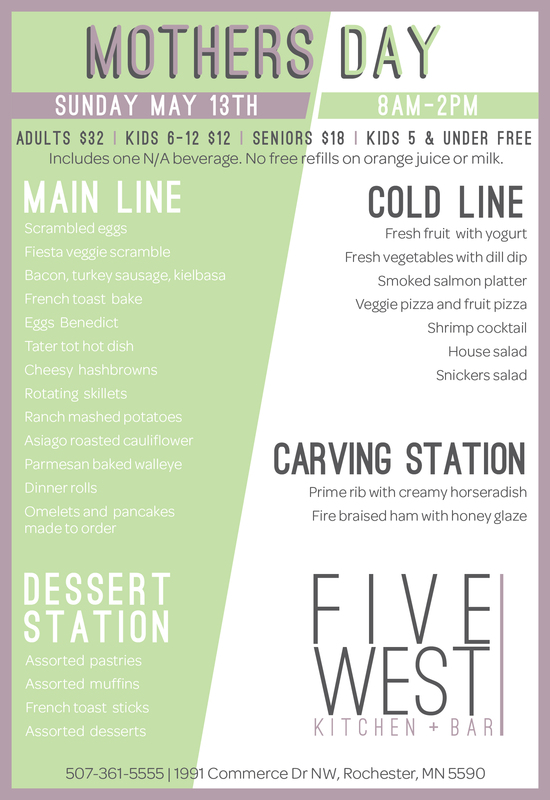 You can enjoy everything from a Fiesta Veggie Scramble to Parmesean Baked Walleye, a carving station with Fire Braised Ham with a honey glaze and of course a dessert station. With nice weather you can even enjoy this out on the patio! Make mom smile with some delicious Buttermilk Pancakes or a Garlic Spinach & Chicken Omelet. This incredible buffet offers items like Oyster Shooters, Beet Cured Salmon, Snow Crab Legs and more. Plus, your choice of a Mimosa or Bloody Mary. Each mom will be treated to a complimentary mimosa. Enjoy an all you can eat Brunch featuring fresh seasonal salad, fresh fruit, yogurt parfait, croissants with butter, jellies, honey and peanut butter, eggs, french toast, bacon, gouda hashbrowns, mac and cheese, a meat carving station and some sweet treats. Pick a Mimosa or Bloody Mary and indulge with Baked ham, Bourbon cranberry salad, Bourbon glazed salmon, Caramel bread pudding and even Chef carved prime rib!